It’s best not to give your dog water or food for at least one hour after they come home from a boarding stay. When San Diego dog owners come to pick up their pets from Fon-Jon Pet Care, it can be hard at times to say who’s more excited—owners are ecstatic to see their pooches, and the pups are beside themselves with joy. After all, even though we do everything we can to make dog boarding comfortable and fun for your pet, there’s no place like home. That said, there are a few precautions you should take when you first bring your dog back home after a visit to any pet care facility, including our kennel. You want to bring your dog right in the door, but if you want to avoid any accidents in the house, it’s best to walk your dog up and down your block (or even just around your yard) before you head indoors. The excitement of seeing you again can bring on an overactive bladder in even the most perfectly house trained pooch. Even if it’s your pet’s normal dinner time, it’s best to wait at least an hour after arriving back home before offering your dog food. All of that tail wagging and jumping for joy can also make Fido’s stomach do flip-flops. That kind of excitement tends to make dogs eat more quickly, which all becomes a recipe for vomiting. 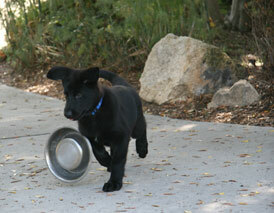 Wait until your pup has calmed down before offering food. If your dog is especially agitated or is normally a fast eater, you might even split the normal amount of food you’d give for one meal into two smaller meals. Lots of happy panting plus the car ride home means that your pooch has built up a powerful thirst. Just as with food though, slurping down an entire bowl of water quickly can lead to vomiting. Rather than letting your dog drink all he wants in one go, limit the amount of water you put in his bowl at first. Another option that’s especially good for smaller dogs (and for playful puppies who can turn anything into a game) is offering ice cubes for your pet to lick. 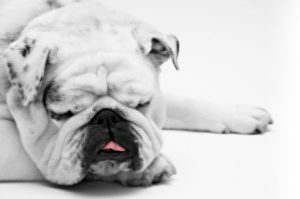 If your dog seems a little more tired than usual the first few days after boarding, don’t worry too much about it. The thrill of seeing you again and the extra flurry of activity surrounding homecoming may mean your dog needs more shut-eye than usual. Remember, if you have any questions about dog boarding, day care, or dog training, just give us a call or send us an email—we’re always here to help!